By the end of the book, most readers of the Antichrist believe they know what Nietzsche (Fred to his friends) is attempting to convey, namely the evils of Christianity. And they may be correct. However, this researcher remains unconvinced that the majority of readers or any exegesis of the Antichrist contain the most relevant insights. Fred heaps coals on the heads of the Protestants ("Berlin") and Roman Catholics ("Rome"), but ignores the Eastern church (Constantinople). Are we to believe that a competent philologist is unaware of the Greek Church? We should expect Fred to mention the Eastern church, if only in a passing critical remark. But, there no critiques that can only be applied exclusively to the eastern church. The unsuspecting or uncritical reader may "lump" Rome and Istanbul together, however we can not allow this rush to judgment to hinder our investigation. As stated previously, Fred was a philologist and as such he must be aware of the Greek prefix "anti". The first definition is "against, opposite or opposed" and most people are familiar with this definition. The second definition means "in place of" and the words in English that have the same meaning of "in place of" are vicar and, as an adverb, vicariously. 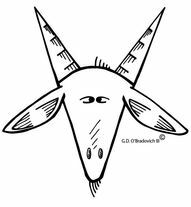 Therefore, the title "Antichrist" can be understood as "Vicar of Christ". Of course, the vicar of Christ is one title for the Pope. We will attempt to find evidence, both compelling and otherwise, to determine if the Antichrist can be applied to the Roman Church, generally, and to the Pope, specifically. The unsuspecting Apprentice may be tempted to count the number of sections (61), find the middle section (30 /1/30 or 31) and falsely believe that Fred's goal of the book is to critique Saint Paul. The unsuspecting researcher would not realize that Saint Paul may be a cover for the Roman Church or western Christianity. The feasts of Saints Peter and Paul are celebrated by both the Roman and Greek church. Unlike the Orthodox church, the Roman church has merged their feasts days and it claims that both the Petrine and Pauline privileges are invested in the institution of the Papacy. 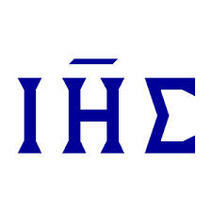 The Greek letters iota, eta and sigma are the first three letters of "Jesus" in Greek. This is the abbreviation found in all early manuscripts. 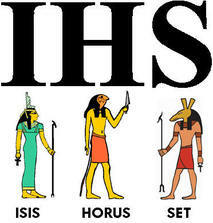 A modern, incorrect and fanciful interpretation of "IHS". We read in almost every section of the Antichrist that Christianity has changed the good news into bad news, the evils of the priestly instinct and the "death affirming' and "life denying" doctrines. Several times "Primitive Christianity" is referred to but not explained to this commentator's satisfaction. Does Fred see the Orthodox church as a type of primitive church and, by extension, beyond modern criticism? We may never know for certain, however we know Fred does not expressly mention the Greek Church. The Roman Church created the Bible, accepted the immoral soul as dogma in 1515, but they do not know who is saved or who is damned. However, the Protestant churches dogmatically know the books of the Bible and its history, the truth of the immortal soul and the guarantee of salvation. The knowledge of these issues must be considered the opposite of primitive, as they have evolved. We are confident to state that Fred believes that history as it is currently related to an unsuspecting world was created in the 16th century. Fred must know that he is on solid philological ground to make such statements. Fred is aware, all too aware, "that difficulties lurk behind every word" of the New Testament [Section 44] (Jesus, the Jesus or the Savior). The following are quotes from the Antichrist, followed by commentary. "Published" implies a printing press. Fred could have written "duly written", but did not. What do I care for the contradictions of “tradition”? How can any one call pious legends “traditions”? These "traditions" are the history of the church. Final ellipse in the original. Final ellipse in the original. Here Fred's writing is most accusatory and blatant. However, he does not explain how or why the church falsified all of history. Fred alludes to holy books as fraud in word. Early Christian is in quotes in the original. Fred knows that the early Christians (Church Fathers) did not write endlessly. Final ellipse in the original. The gigantic frauds are the literary creations of the western church, such as the Church Fathers, and the falsification of history. "Christian agitators" are the early confessors and Church Fathers. Although Saint Augustine is influential in the Roman Church, the Orthodox Church knows so little about him that their knowledge can be considered "ignorance". 3. the falsification of church and world chronology in order to make Rome triumphant over her enemies and to be the culmination of history and man's achievement. As always, the Gentle Reader will come to his own conclusions.